Even our youngest students were captivated by the amazing performances we had of Tubby the Tuba! The book Tubby the Tuba was written by Paul Tripp in 1954, and we are grateful that his son David Tripp narrated it for us. If you aren't familiar with this classic story, it is about the adventures of a tuba named Tubby. "All day long Tubby plays oompah, oompah with his orchestra, but what he really wants is to dance with the pretty little tune. Tubby finds inspiration from a frog down by the river. He learns that everyone deserves to play his own melody." On tuba, Dr. Eli Newberger, on piccolo and flute, Dr. Carolyn Newberger, on trombone, Henry Newberger, on violin, Christine Singer, on cello, Beth Craig, on saxophone, Rob Fisch, were all spectacular. Our ECC children were delighted by the music of the instruments and the expression in David Tripp's voice. Our first and second grade students loved the story but were also treated to a short performance by each musician with a little information about his/her instrument. One of our long standing teachers said, "I've been here 30 years and this was the best performance we've ever had." We are so grateful to the donor that made this performance possible. 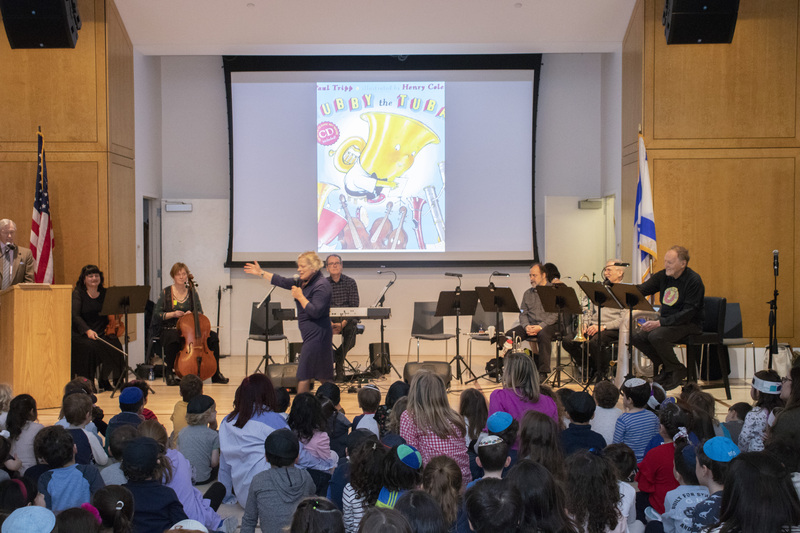 The program was generously sponsored by a Ramaz ECC/Lower School family. Please click HERE to view the event.